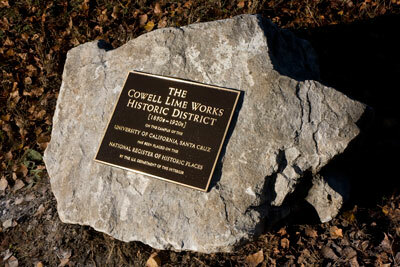 With the unveiling of a permanent bronze plaque from the National Register of Historic Places, the Cowell Lime Works Historic District became not only the gateway to UC Santa Cruz, but also "to stories yet untold." "It's a resource that's just beginning to reveal its potential," said Friends of the Cowell Lime Works Historic District President Frank Perry, in remarks to a crowd of about 50 people at Friday's unveiling. Speakers at the ceremony included representatives from the offices of Rep. Sam Farr and Assemblyman Bill Monning; County Supervisor Neal Coonerty; Santa Cruz Mayor Cynthia Mathews; alumnus and former Assemblyman John Laird; and Chancellor George Blumenthal. Congressman Farr entered remarks about the ceremony into the Congressional Record on October 29. "I want to uphold this historic district as a model of maintaining our state's historical integrity," said Farr in the Congressional Record. "Historical spaces like these are an example of what makes our community a national leader in the preservation of lands which continue to shape our society." 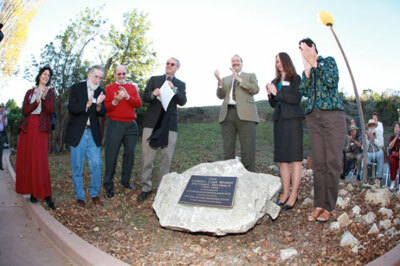 The district, said Blumenthal, "speaks to the important past of the Cowell Ranch and its place in Santa Cruz history." He noted that the lime workers of the past came to what is now UC Santa Cruz in a quest to find employment and better their lives--as do students in the present day. "So I think the story continues," Blumenthal said. The speakers then together removed the covering from the bronze plaque mounted on a base of limestone and placed outside the Cook House. The historic district is an area of about 30 acres around the main entrance of the campus on either side of Coolidge Drive. It includes historic buildings and lime production features and related support facilities that date to the latter half of the 19th and early 20th centuries. The site was added to the National Register of Historic Places, the nation's official list of significant cultural resources worthy of preservation, in 2007. The historic district includes the Granary, now a childcare center; the Cook House, now the Admissions office; several barns; the Cooperage, where barrels for lime shipping were made; the ruins of former workers' cabins; the Blacksmith Shop; Cardiff House, now the Women's Center but formerly the residence of lime works owner Henry Cowell; and the lime kilns themselves. UC Santa Cruz is the only institution of higher education in California that has an historic district listed on the National Register of Historic Places, according to Joe Michalak, vice president of the Friends group and former head of Reference Services at UCSC.